See what reviewers have said about this award-winning book! Napoleonic scholar J. David Markham has again produced a book of singular importance to the understanding of the Napoleonic era. Few periods of Napoleon’s career capture the imagination more than that of his exile on the island of St Helena from 1815 to his death in 1821. Those years have provided more than their share of controversy, from the unfortunate treatment of Napoleon by the British governor, Sir Hudson Lowe, to the question of exactly how Napoleon died. Many of the people involved in Napoleon’s exile have published their memoirs or journals, and it seemed that there was nothing else left to learn. That is, until David Markham’s book, Napoleon and Dr Verling on St Helena arrived on the scene. Central to Napoleon’s six years on the island was the question of his medical care, and a succession of doctors was appointed to fulfill that role. The best doctor appointed to care for Napoleon was the Irish doctor, James Verling, on the island as medical officer to a British military unit. Verling, unlike other medical personnel on the island, actually had a medical degree and was clearly the best physician on the island. But the tension between Lowe and Napoleon was such that Napoleon would never accept a doctor appointed by his British jailor. Even so, Dr. Verling treated members of Napoleon’s staff and was involved in the often petty and always fascinating events of the island. Verling kept a journal that until now had not been published in its entirety. Verling’s journal gives us a fresh and fascinating view of life in some of Napoleon’s last years. Verling never treated Napoleon. This was unfortunate for Napoleon, as a doctor of Verling’s ability might well have properly analyzed what was happening to destroy Napoleon’s health and taken steps to deal with the problem. It has now been scientifically proven by the most modern analysis conducted by Dr. Pascal Kintz, President of The International Association of Forensic Toxicologists, that Napoleon was poisoned. The scientific analysis of Napoleon's hair indicates that the source of the arsenic was mineral. This is the most toxic form of arsenic, and was used in France for many years as rat poison. These results were accomplished on the latest scientific analysis equipment that was just manufactured. This confirms all the previous testing made on Napoleon's hair on my behalf. Verling would have been just the doctor to recognize the symptoms, make the proper diagnosis, and alert the British to the need to remove Napoleon from any possible source of poisoning. While this might not have led to his freedom, it might well have allowed him to die of old age after having dictated far more of his memoirs than he did. J. David Markham is one of the premier Napoleonic authors in the world and has made yet another important contribution to the field of Napoleonic history. Napoleon’s exile on the island of St Helena from shortly after his defeat at Waterloo in 1815 to his death in 1821 has always been one of the most interesting, and tragic, periods of his great career. With his book, Napoleon and Dr Verling on St Helena, Markham tells what may be the last major story to come out of that period. The British were very concerned that Napoleon receive excellent medical care and took steps to see that he did. But the parade of doctors became almost comic, as each soon became embroiled in controversy or, in the case of his last doctor, incompetence. Markham tells us that without doubt the best doctor appointed to care for Napoleon was the Irish doctor, James Verling who, unlike most military “doctors” of the day, actually had a medical degree. The two had met on the ship from England, and Verling was assigned as medical officer to a British military unit. When the second of Napoleon’s doctors left in disgrace, the Governor of the island, Sir Hudson Lowe, appointed Verling to care for Napoleon. Napoleon was having none of it, however, and Verling never treated Napoleon (though he did treat members of Napoleon’s entourage). What is fascinating about this book is that Markham presents for the first time Dr. Verling’s journal. Through it, we see the petty and often absurd soap opera that was live in exile. This journal is most likely the last such document of any significance from Napoleon’s time on St Helena, and Markham provides an invaluable service by making it available to the public for the first time. In addition to the journal, Markham includes important letters from the Lowe Papers in the British Library. 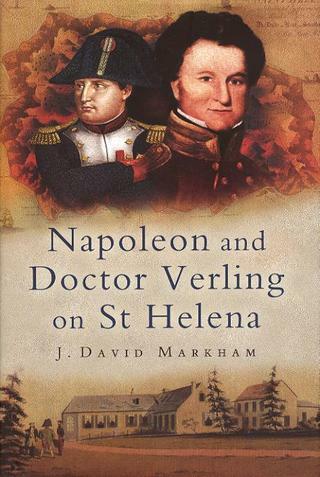 J. David Markham’s Napoleon and Dr Verling on St Helena is a major contribution to our understanding of Napoleon’s amazing career. It provides what is likely the final key to understanding the last phase of Napoleon’s career. As such, it belongs in every Napoleonic library. J. David Markham, a Napoleon scholar and biographer and President of the Napoleonic Alliance, has discovered something new to add to the historical interpretation of Napoleon and his legacy...Markham's book should not be missed by anyone interested in the life and death of Napoleon or in early-nineteenth-century ailments and their treatments.